Blessings plus gluten free/ fat free breakfast banana bread! Hey there everyone! I’m a little late on posting, however it’s for a good reason. this past week went by the flash! Amidst the chaos of everything, God broke through with blessings in the middle of my storm! While I was battling issues with being cooped up in my apartment with little several days a week, still was not able to run, and in severe pain at times while still having to lift little guy along with the financial struggles… Wow! I kept pressing in… praying, getting in the Word. Wednesday came along and mom and I attended Bible study. As always, I was completely blessed! I shared one of my passions with the group by bringing some homemade, gluten free, fat free banana breakfast bread for everyone along with a veggie tray from mom and me. The fellowship, food… such a relief from lonely days at home! After study, little guy and I were given a special treat! Some friends of ours from Hilltop Community Church allowed us to hang out with them while my mom cleaned a house in the area. They surprised us with a trip to Fairy Land in Oakland!!! Little guy had such a blast! He ran around, looked at the animals and the fun sights. We even rode a kiddie train! What touched my heart the most is that these people had taken the time out of a busy day, full of moving and church responsibilities, despite their exhaustion, to show little guy what a real “mom and dad” set is like. Little guy stayed glued to my friends husband. I cried as I watched him hold his hands and run around so happy! Just what he needed, and God knew! We parted ways and went on to finish our weeks. I headed out to start a house sit, then… went to the chiropractor. Right away, he found the issue! Adjusted and back on track… I headed out the door with clear instructions from him and… he encouraged me to get back out there and run!!! So, I continue to do my balance work and.. Lord, willing will be racing again soon! Finally…. As I mentioned in a few previous posts, my mom’s car was having troubles. Well, some childhood friends of mine and family responded to a prayer request I posted on Facebook. These people have been there time and time again… they’ve given my mom and me so much help over the years that when they first responded… my mom and I felt guilty in accepting. However, they encouraged us to accept their help. They were going to be in town over the weekend, and wanted to meet up with us to give my mom a car!!! We set it up to meet after church service, however… the craziest thing happened! In the whirlwind of getting out of service, my mom see her phone on the back of her car and drove off! We hadn’t set an exact time or place to meet them, so… without it, we had no way to reach them! When we’d realized it was gone, we’d already gone to the grocery store and had to head back up to Hilltop. We retraced our steps and didn’t find it. Then… I told my mom to check the street. Just as we headed out towards the freeway, I spotted it! She got out to find it smashed and scattered all over the street! Right away, I offered her my old android so she could activate it with her number. Low and behold… while she was in the phone store working out the phone issue, I spotted one of the people who was giving us the car ! Totally divine appointment! We spent some time talking and catching up, then they gave us the car and we parted ways. What a blessing to see them! It’s been far too long! If only we’d been given more time to see them =/ hopefully we’ll get another opportunity. so, here it is… the beginning of another week and God only knows what lies ahead. However, I’m choosing to thank For for each amazing blessing He’s surprised us with.! Man.. so much to post and my reason for telling y’all all of this? Well, to encourage you to face giants with courage! Know that whatever battle you face, it belongs to the Lord! Praise Him for every victory no matter how big or small. PLUS, in every storm, there’s always a blessing! 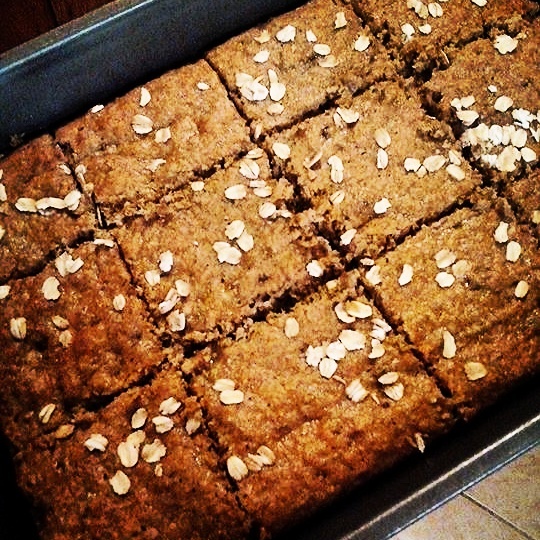 Today, I’ll close with the recipe for the banana breakfast bread that I made for bible study! Have a blessed week! Preheat oven to 350°. Spray 8×10 baking pan with cooking spray. Mix dry ingredients and wet ingredients separately, then slowly mix them together. Place them in pan, sprinkle a handful of rolled oats over the top and pop in the oven for 25-35 min or until a toothpick can be poked in center and pulled out clean. Let cool, cut into pieces and enjoy!